Caption: Mahina Maeda (HAW) enjoying the spoils of victory at the Samsung Galaxy Hainan Pro. 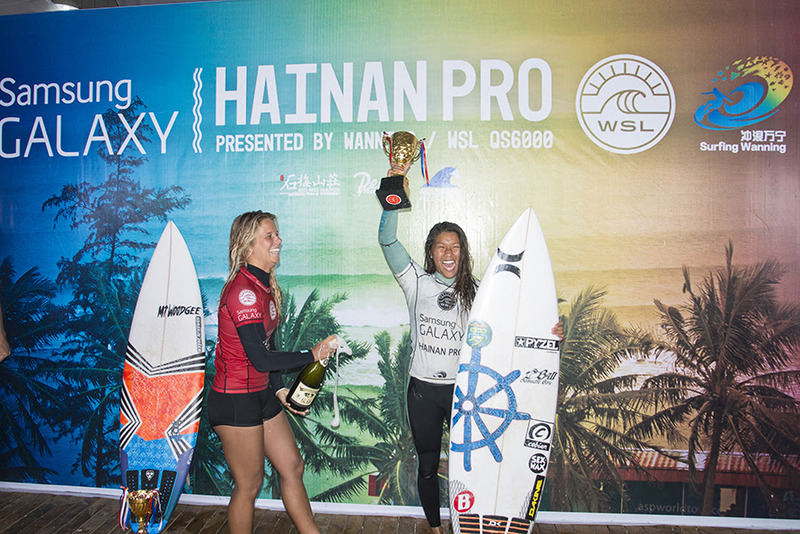 WANNING, Hainan/China (Monday, January 18, 2015) - Mahina Maeda (HAW) has taken out the first women’s Qualifying Series (QS) event of 2015, the Samsung Galaxy Hainan Pro presented by Wanning over Paige Hareb (NZL). The surf continued to pump out the goods as the event ran through the Quarterfinals, Semis and Final with competitors holding nothing back in the fight for all-important QS6000 ranking’s points. Caption: Bronte Macaulay (AUS) scored the first 10-point-ride of the Samsung Galaxy Hainan Pro. 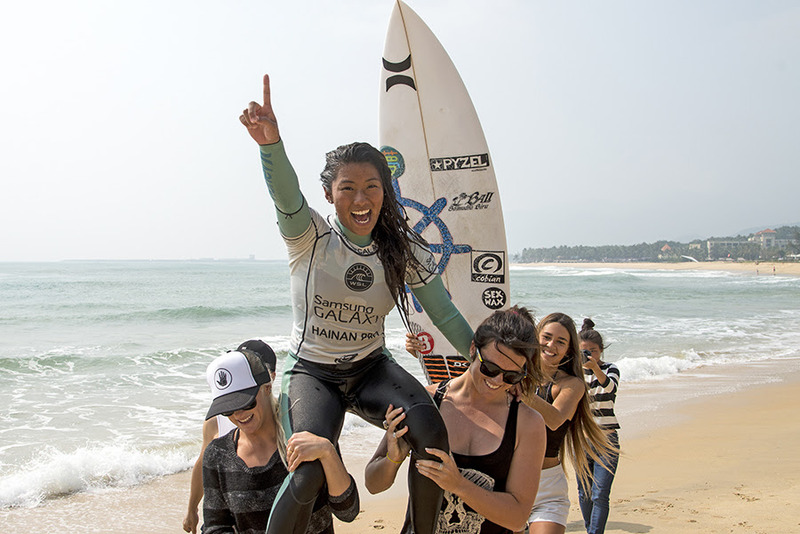 WANNING, Hainan/China (Sunday, January 17, 2015) - The field that started with 72 of the world’s best surfers has been reduced to just eight Quarterfinalists at the first women’s Qualifying Series (QS) event of 2015, the Samsung Galaxy Hainan Pro presented by Wanning. The athletes revelled in the pumping long left handers on offer at Riyue Bay, with competitors battling for all-important QS6000 ranking’s points. Bronte Macaulay (AUS) sealed her spot in the Quarterfinals with style — posting the event’s first perfect 10-point-ride. Macaulay used her polished frontside attack to carve her way down the line and secure one of the final eight spots left in the event. Dave Macaulay, Bronte’s father is a former professional surfer who was ranked No. 2 in the world proudly remarked that he had never scored a 10 in his career and was proud of this achievement of this daughter. Ellie-Jean Coffey (AUS) made her intentions clear at this year’s Samsung Galaxy Hainan Pro, surfing fast and hard and posting near-perfect scores on her forehand. Coffey has competed at a number of QS events in the past, but has admitted that this year her focus is to qualify for the World Championship Tour (WCT). Justine Dupont (FRA) has had a turbulent trip to China for this event, her bags didn’t arrive and she was forced borrow untried and untested equipment, but that didn’t stop her from battling through some tough competition to secure a spot in the Quarterfinals. Tatiana Weston-Webb (HAW) is one of the most exciting up-and-coming surfers in the world right now, and is using this event to prepare for her rookie year on the women’s WCT. Mahina Maeda (HAW), reigning World Junior Champion has been keeping her competitive red-hot form rolling all the way from her World Title win in Portugal last year to the shores on China at this event. Caption: Ellie-Jean Coffey (AUS), on fire in Wanning, Hainan, China. WANNING, Hainan/China (Saturday, January 16, 2015) - A crop of the world’s best female surfers lit up the surf in China at the first women’s Qualifying Series (QS) event of 2015, the Samsung Galaxy Hainan Pro presented by Wanning. The event ran through two and a half Rounds of competition in excellent surf Riyue Bay, with competitors battling for all-important QS6000 ranking’s points. Pauline Ado (FRA) kicked off her 2015 in fine form, easily posting a heat win to advance to the Round of 24 with two 8 point plus rides. Ado didn’t re-qualify for the Women’s World Championship Tour last year and is fired up to re-claim her spot for next year’s Tour. Paige Hareb (NZL) and countrywoman Ella Williams (NZL) put on an epic show in the Round of 48 heat today, advancing in 1st and 2nd respectively. Hareb is another of last year’s WCT surfers who didn’t re-qualify and is here in China to fight for precious points and a big start to the year. Isabella Nichols (AUS) posted an impressive Round of 48 heat win with Mikaela Greene (AUS) also advancing in 2nd position. The young Aussie pair eliminated WCT surfer and one of the event’s top seeds Laura Enever (AUS) in a tight tussle. Caption: Laura Enever (AUS), making the most of her time in Wanning, Hainan, China. WANNING, Hainan/China (Friday, January 15, 2015) - Small surf sees the world’s best female surfers have the day off in China at the first women’s Qualifying Series (QS) event of 2015, the Samsung Galaxy Hainan Pro presented by Wanning. The event was put on Standby even though the swell was on the increase throughout the day as the forecast is calling for excellent conditions in the coming days.